There’s no doubt that friendships are the foundation on which we build our lives. The health of our relationships is a good indicator of the overall quality of our lives. Good friends are there to lift us up in troubling times and to celebrate our successes. They give and take in equal measure. They provide a sounding board and a reflection of ourselves. In fact, our friendships are so influential in our lives that motivational speaker Jim Rohn has said that we are the average of the five people we spend the most time with. If we approach our friendships with this idea in mind, doesn’t it stand to reason that we should be more aware when we choose which relationships to cultivate? Should we not then demand the best from our confidantes, and offer our best in return? This is not to say that if you want to be rich that you immediately go out and befriend the five richest people you can meet. This is about the quality of someone’s character, their views on their place in the world, and the attitude with which they approach life. I’ve been awfully lucky to have such tremendous friends in my life. Some of it is by pure luck – I stumbled upon some really wonderful people and became friends effortlessly. 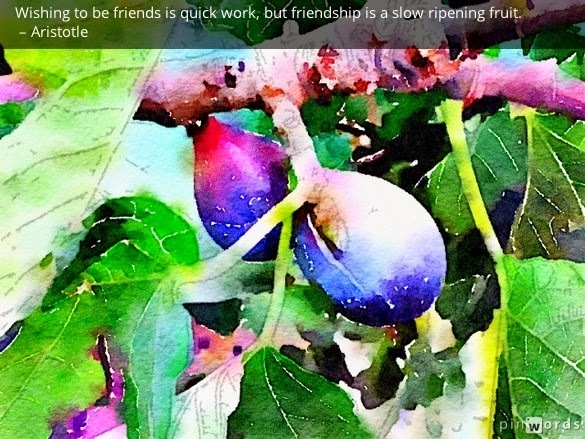 Others friendships took more time to develop, and were approached with intention and care. As we get older, time becomes more valuable. We must become more choosy when it comes to deciding with whom to spend this precious commodity. These are the tenets I live by these days when beginning new friendships or nurturing old ones. 1. A good friend challenges you to become a better version of yourself. Friendships grow and change over time, as do people. A good friend lets you see yourself through their eyes, in a way that challenges you to make better choices, invest in yourself, and grow. This can take the form of being a cheerleader for you or staging an intervention if necessary. But no matter what form that challenge takes, it is done in a loving manner with your best interests in mind. 2. A good friend gives you their best self. Going along with the first tenet, a good friend is willing to give you the best version of themselves. This isn’t to say that there aren’t tough times when they need support and encouragement. But it’s done without excess drama or emotional neediness. A good friend can be vulnerable without sucking all your energy away. They aren’t a vortex or a black hole for your goodwill. They understand the gift you give with your friendship, and acknowledge it. They don’t try to drag you down with them. 3. A good friend looks for opportunities to lift you up. Life is always throwing us curveballs, but good friends are those that look for ways to buoy your spirit, and opportunities to improve your life. This could be something as simple as sending a thoughtful note or as big as recommending you for a great new job. A good friend is on your team and sees your happiness and success as part of a team effort. 4. A good friend understands to the need to mutually nurture the friendship. Life is rarely equal. When one friend is experiencing great success, the other may not. But there is an equal give and take between them. Good friends spend just as much time nurturing the friendship as you do. They initiate plans to meet up. They provide an ear when you need to talk. And because they are there when you need them most, they inspire you to do the same for them. Good friendships are two-way streets, with both parties valuing what the other has to offer. 5. Good friendships have mutually determined boundaries. It’s rare that I would choose to spend too much time with someone who is constantly crossing the line, such as calling in the middle of the night, making unrealistic demands on my time, or asking me to engage in risky behavior of some kind. Good friends know what the parameters of the relationship are, which often grow organically out of mutual respect. They know when to step in when needed, or to take a backseat when you need space. And if they don’t know, they aren’t afraid to ask. 6. A good friend keeps an open mind. Some of my best friendships are with people who have different world views from my own. An essential ingredient to any successful friendship is a willingness to have an open mind and to consider a different point of view. You don’t have to agree, but a good friend respects your opinions and finds ways to achieve understanding without sacrificing their own. 7. A good friend celebrates your success. Nothing kills a friendship like jealousy, and no two people are going to succeed at the same time or at the same rate. A good friend will nonetheless celebrate your successes with you and not undermine your achievements. It goes without saying, I hope, that these tenets apply not only to the friends you choose, but also to the friend you choose to be. Cultivating meaningful relationships takes equal effort, and being a good friend can attract good friends in return. What do you look for in a friend, and how are you a good friend to others? I’d love to hear your thoughts in the comments. Previous PostThe Skinny on Being a Fat GirlNext PostWhy Are Good Habits So Elusive?